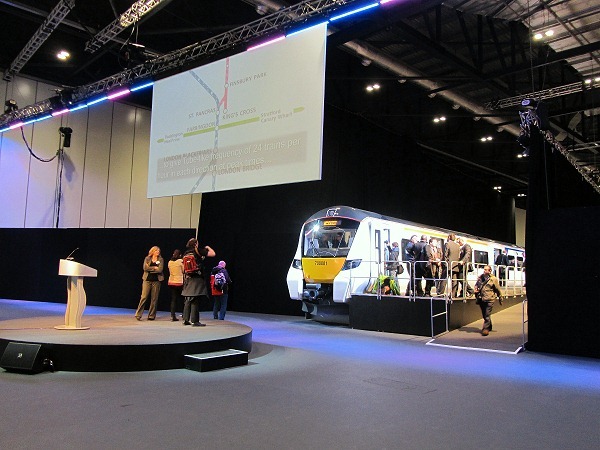 The Thameslink Programme and First Capital Connect displayed mock-ups of interiors of the future Siemens Class 700 units at Excel, Docklands, London on 28th and 29th January 2014. The first day was the launch for the railway industry, politicians and press, the second day for railway staff in the morning and for the public in the afternoon. 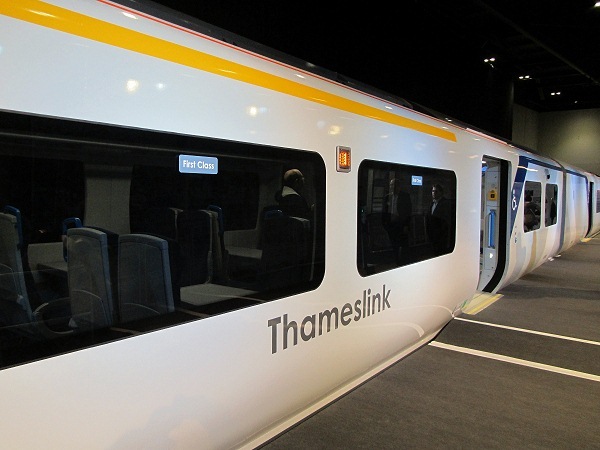 Within Hall S11 there were comprehensive displays detailing aspects of the Thameslink Programme, a bogie and a two car mock-up. 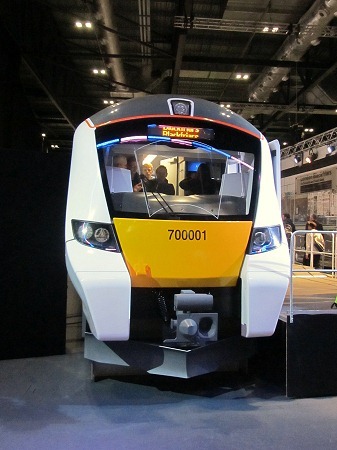 The Class 700 is the first of Siemens' new Desiro City range with a cab front which is not unlike the cab front of a Class 380 unit without the corridor connection. The offside cab door and footsteps. Note the graphical representation of the bogie! Two generic cars, which appeared to be made from, amongst other materials, plywood, were available to walk through. The interiors did not represent the configurations of two actual cars but were designed to display aspects of a whole 8/12 car train. 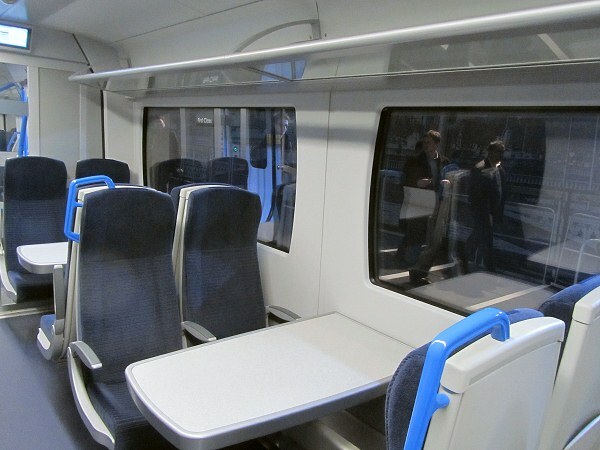 The front car contained a cab, first class accommodation and a wheelchair accessible lavatory, the second car standard class accommodation including a wheelchair position, bicycle storage and a standard (i.e. small) lavatory. 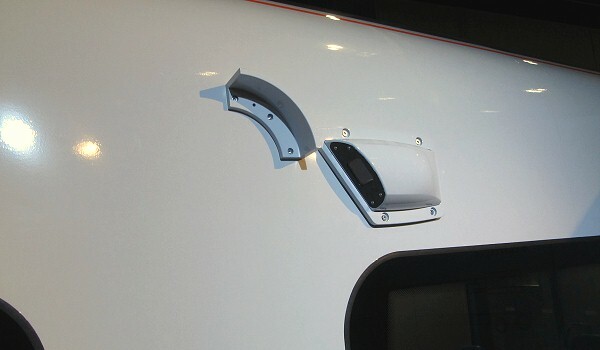 A door camera, which appears to be similar to those used on Classes 377 and 379. At long last a return to slam doors on a train! This being the door into the first class saloon. However, is this wise? 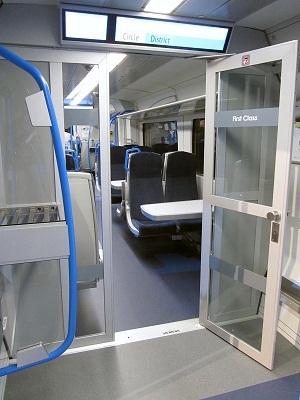 There are going to be difficulties opening it when the vestibule is packed with standing standard class passengers. 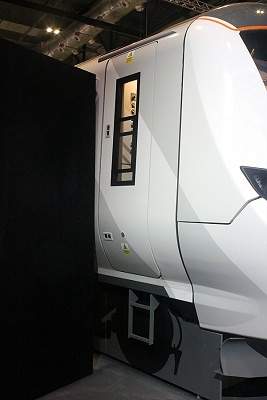 On this mock-up the first class accommodation was behind the cabs, as per the proposed configuration for real 8 and 12 car units. 2+ 2 seating throughout and this is where you need to be on the train to have a table.